How Clean is Your Student’s Dorm Room? It’s that time of year again when parents send their teenagers back to college with mixed emotions. Summer always ends much too quickly – especially in New England. But the inevitability of back-to-school is upon us. 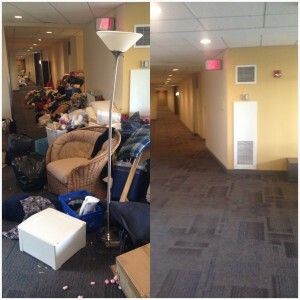 As parents write those hefty tuition checks each semester, it’s doubtful that much thought is given to the cleanliness of the dorm rooms that students inhabit for nine months out of the year. At Eagle Cleaning Corporation, however, it’s all we think about. We are in the business of providing commercial cleaning services to such institutions of higher learning in the greater Worcester MA area. So, trust us when we tell you that it is no small feat making those rooms sparkle and shine. From carpet restoration to floor stripping and refinishing to restroom sanitation to overall detailed cleaning of all the nooks and crannies in each dorm room – we do it all! And we do it so you don’t have to give it a thought. But it wouldn’t hurt to ask your college student to do their part to help us out – maybe just a little – throughout the semester. After all, scraping decayed pizza off of a ceiling isn’t fun for anyone. Call today or Request a quote now! Here’s a before and after shot of general dorm cleanup at the College of the Holy Cross in Worcester. This entry was posted in Carpet Cleaning and tagged cleaning services Worcester, commercial cleaning services Worcester, commercial cleaning Worcester. Bookmark the permalink.